Is Mildenhall a town or a village? I'm never sure. The centre has a few shops, but I am sure it would have more if it wasn't for the fact that virtually everyone who lives here works on the base, or knows someone who does. If you work on the base you can shop on the base, leaving the poor and marginalised to patronise the takeaways and discount shoe shops. Oh, and the tanning salons. Mildenhall has lots of tanning salons. Where do all the people live? Despite creaking under the burden of the American occupation, Mildenhall town centre is actually quite historic, something which contributes to, rather than distracts from, its shabbiness I'm afraid. The Anglican St Mary stands very aloof from it all. But if you head out of town on the Lakenheath road, you come across a huge estate on the former College Heath. The houses have been built among the pine trees, and on this very warm day there was a wonderful scent in the air, as if I was in the Sologne or the Vendée. The roads of the estate are organised to make it easier to get to the base than to the town centre, of course, and I dare say you could live here without ever needing to visit the old bits. Despite the lovely setting, the estate is not one of Suffolk's richest areas, as I am afraid the graffiti and vandalised cars confirmed. 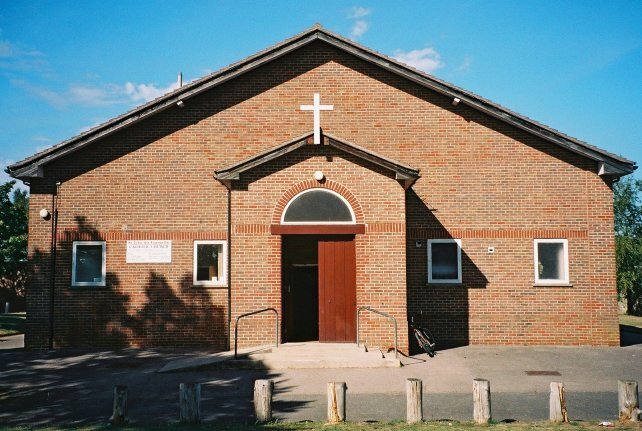 I cycled up St John's Road looking for the Catholic church, and was rather surprised to eventually find myself in a large play area with a school beside it. Opposite, there was a small version of one of those 1980s shopping centres that is all atriums and plazas. Again though, there were hardly any shops. 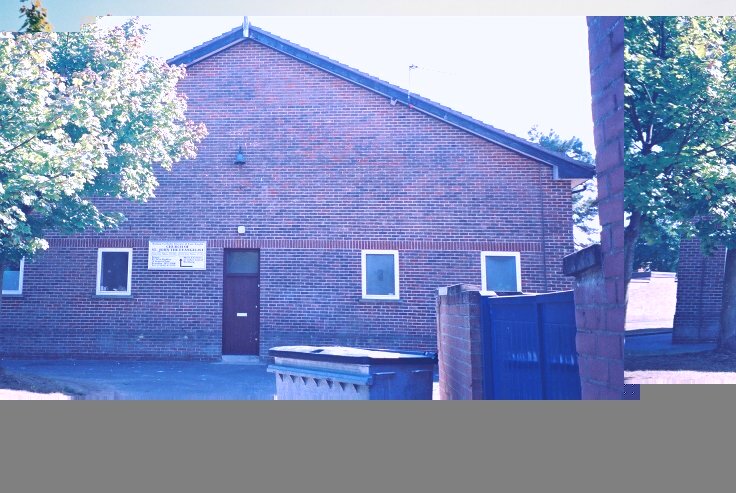 The three largest were an off-licence, a tanning salon (naturally) and a pentecostal redemptionist ministry. How fitting! Three of the great obsessions of the 21st century English working classes all gathered together in the same place: cheap alcohol, Mediterranean styling and protestant fundamentalism. Just beyond the shopping centre it was with some relief that I found St John. It has its back to the road, but the frontage is on to the green, which was rather nice. 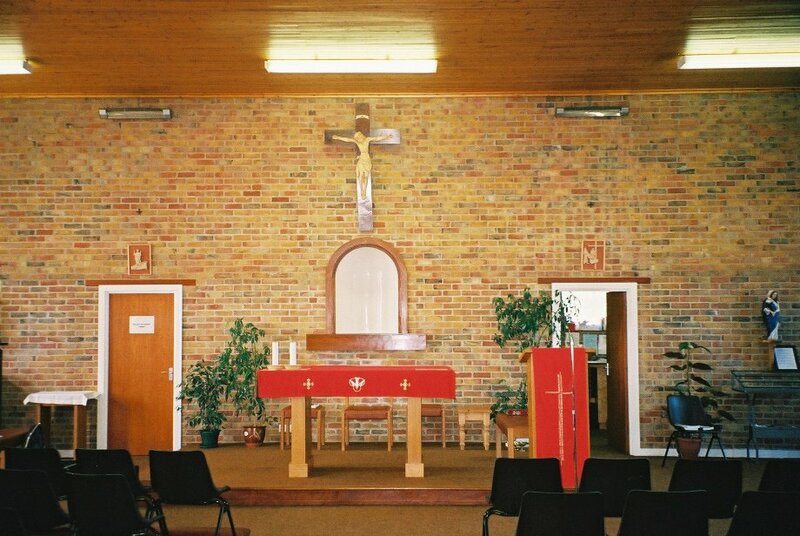 It is a simple red-brick affair of the early 1990s, a daughter church of Brandon, typical of many small-town Catholic churches. I stepped into the main entrance. Offices and a kitchen were on either side, and the church itself ahead. It is a large, square space, although the sanctuary itself is quite traditional, being set against the east wall. The plastic chairs are functional, and nothing there is extraordinary except for one thing. Set in one corner, and taking up fully a quarter of the church, is a massive baroque organ case. Where on earth did it come from? What on earth is it doing here? This was more evidence, and not unpleasantly so, of how those people in Mildenhall are, you know, just a bit different to the rest of us.